Opened in 1981, the Dedmon Center, a versatile athletic complex on the campus of Radford University, recently underwent a multi-million dollar facelift, which makes it one of the premiere collegiate athletic facilities in the Big South Conference and Mid-Atlantic region. 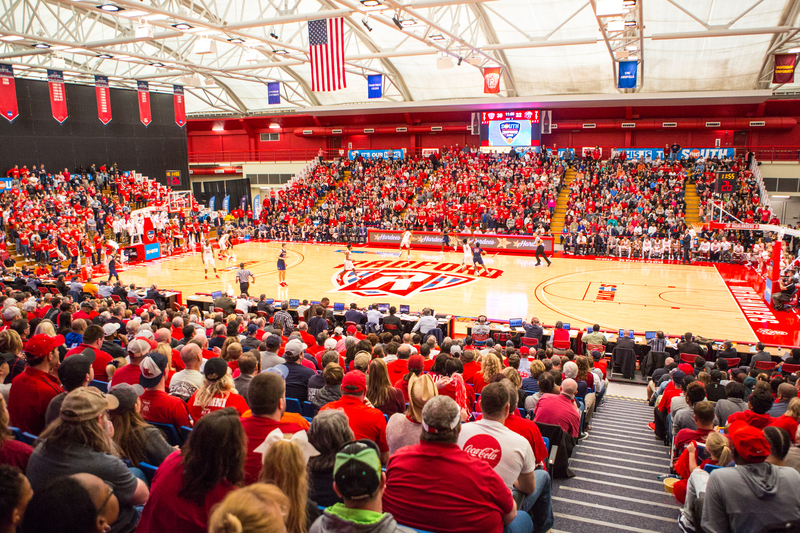 The Radford University men's and women's basketball, and volleyball teams call the main arena of the Dedmon Center home. The hardwood floor was produced by Horner Flooring, located in Dollar Bay, Michigan and founded in 1891. Along with Radford University, Horner Flooring can be found at Allen Fieldhouse (University of Kansas), The Breslin Center (Michigan State University), The Kohl Center (University of Wisconsin), ALLTEL Pavilion (Virginia Commonwealth) and the Georgia Dome, which hosted the 2002 NCAA Final Four. Branch & Associates, Inc. (Roanoke, Va.) was responsible for the largest part of the renovations, which consisted of replacing the facilities’ air-supported fabric roof with a more modernized fabric structure, supported by nine steel trusses. By replacing the air-supported roof, a new air conditioning and air circulation system is being installed throughout the facility, making it more adaptable for all seasons and a more comfortable and quiet environment. Other improvements to the Dedmon Center include a new high-tech lighting system with shutter capabilities, enhancing the pre-game as well as in-game atmosphere. The improved lighting will also create a more viewer-friendly picture for the television audience. The Dedmon Center also houses the department’s new Learning Enhancement Center (LEC), dedicated to student-athlete support services and a state-of-the-art, 5,000 square-ft. weight room dedicated to the needs of the University’s 16 varsity athletic teams. The complex features several adjoining facilities, including intramural soccer, football and softball fields and intercollegiate fields and courts for baseball, softball, field hockey and tennis. In addition Patrick D. Cupp Stadium adds a intercollegiate soccer and track and field complex. One of the more amazing things about the Dedmon Center is its versatility. The arena area can be customized to the current needs, including setting up a 3,200-seat arena for basketball and volleyball. The arena is also used for concerts, graduation and other large university events.